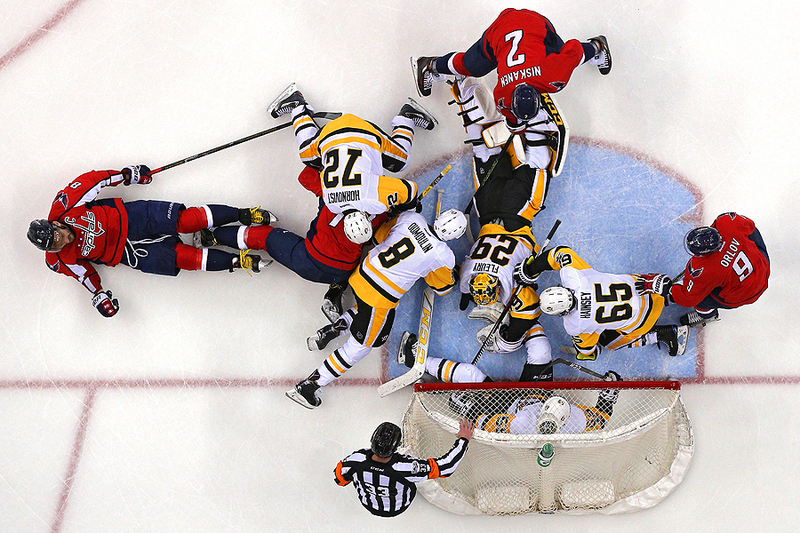 "Goalie Marc-Andre Fleury #29 of the Pittsburgh Penguins makes a save as Pittsburgh Penguins and Washington Capitals players battle for the puck in the first period in Game One of the Eastern Conference Second Round during the 2017 NHL Stanley Cup Playoffs at Verizon Center on April 27, 2017 in Washington, DC." There isn't anything more exciting than the playoffs. No matter what the sport - athletes dream of competing for the championship. But that doesn't come easy. From making the team, to practice, to preseason, in the weight room, watching film, regular season, and every moment in between. It's no secret that it takes what is often said in sport, blood, sweat and tears. With that, there is no better rivalry than the Washington Capitals and the Pittsburgh Penguins. Combine all the aforementioned with those two teams and fans are entertained the entire series. During game one, there was no lack of excitement. A couple of close calls in front of the net made an overhead remote camera not only important, but it helped tell the story of the night - sacrifice. As the Pens and Caps go into game six tonight, it will be a thrilling ride to the Stanley Cup, that's for sure.